Salad: Torn mixed salad greens and sliced almonds. Pitas: Whole wheat pita pocket halves and lettuce leaves. Wraps: Whole wheat tortillas and sliced ripe avocado. In a large bowl, combine the first five ingredients. In a small bowl, whisk the dressing ingredients; pour over chicken mixture and toss to coat. Refrigerate until serving. Serve as desired. Salads: Top salad greens with chicken salad; sprinkle with almonds. Pitas: Line pita halves with lettuce leaves; fill with chicken salad. 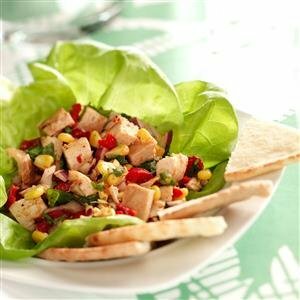 Wraps: Place chicken salad off-center on tortillas; top with avocado. Roll up. Makes 6 cups.